Inspired by her experiences with foreign language learning, in professional settings and in her own family, Christine Jernigan, PhD, set out to write a unique guide for parents who want to raise their kids to speak more than one language. Specifically, Family Language Learning is designed for parents who are still in the process of learning a second “target” language themselves, or who are fluent but living in a country where another language is dominant. Jernigan, who instructs foreign language teachers at North Carolina State University and works as a language coach for parents, writes in a flowing, humorous and engaging style. The many personal anecdotes told by the author, as well as by other parents raising bilingual children, range from amusing to deeply moving. Readers will find themselves relating wholeheartedly to the language learning adventures (and misadventures) these parents have experienced. This book is meant to be a how-to guide, or “springboard” as Jernigan calls it, for parents in the early stages of teaching their children a new language. It is also intended as a motivational tool, or “cheerleader” for when those parents inevitably run into roadblocks, or are feeling discouraged. Throughout, readers are encouraged to remain flexible, and to make adjustments when a situation demands it: “Keep your language plan in play dough, not stone,” as Jernigan very nicely puts it. Family Language Learning stands out particularly because of Jernigan’s unique approach to the subject of language learning. While most experts focus on the academic, social and economic benefits of learning a second language (as does Jernigan, from the very first chapter), this author also explores in depth the greater emotional bond that learning a new language can create. This book is accessible to every stage of language learner, even those at the very start of their journey. Concepts and terminology are explained in a clear and concise manner that assumes you have arrived with no prior language training. Each chapter delves into a different aspect of language learning, from why it’s important for your children to learn a new language to why you should encourage your kids to read foreign language material on their own, and how to motivate them to practice writing in the target language. While Family Language Learning can easily be read cover-to-cover, thanks to Jernigan’s conversational style of writing, the chapters are broken into sub-sections that also make it easy to flip to the particular topic you’re seeking answers to. So, even when you’re well into your language journey, you can find just the right words of guidance and encouragement you need when you reach a bump in the road. Family Language Learning is available in paperback and ebook at Amazon.com . Additional, valuable information on bilingualism and language learning can be found in A Parents’ and Teachers’ Guide to Bilingualism by Colin Baker, a classic book in the field now in its fourth edition. 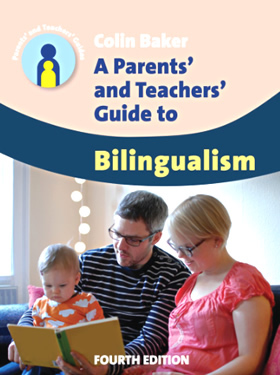 This book is an extremely thorough guide for teachers of bilingual students, as well as parents who are raising bilingual children, whether they are fluent in the second language or not. A Parents’ and Teachers’ Guide to Bilingualism can serve almost as an encyclopedia of language learning because it offers a wealth of information on a very wide range of topics. 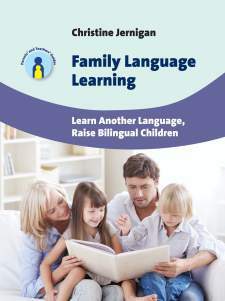 Each chapter is dedicated to distinct subjects, like “Family Questions,” “Language Development Questions” and “Reading and Writing Problems,” and within each chapter are Frequently Asked Questions that Baker has encountered over decades of working with parents and colleagues in bilingual education, as well as in his personal experience successfully raising three bilingual children. A Parents’ and Teachers’ Guide to Bilingualism (4th ed) is available in hardcover and paperback at Amazon.com . This is a very nice book. A family learning a language together will help develop a deeper bond between members, as well as raise bilingual kids who will have an edge when it comes to discipline, information processing, and communication. Would love to have a copy of this book, a lot of parents will certainly learn a thing or two when it comes to raising a bilingual family. Thanks for sharing!